"PUL Dishes out several Prices on Awards Night"
(Monrovia, July 3, 2018)- The House of Representatives has voted to pass into law a bill seeking the repeal of Anti- free Speech Legislations in Liberia. Presenting the outcome of a public hearing on the Bill titled, an Act to amend the Liberian codes revised, penal law of 1978, of the Republic of Liberia, the Chairman of the House Committee on Information, Hon. Jay Nagbe Sloh urged the plenary to pass the bill because its ideal promotes democratic culture. 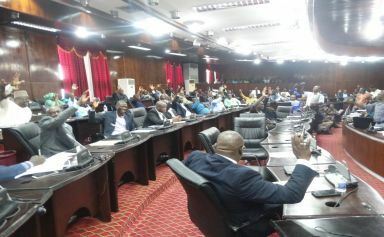 Monrovia, July 2, 2018)- Public hearing for the bill seeking the repeal of anti-free speech legislations in Liberia took place Monday at the Legislature. 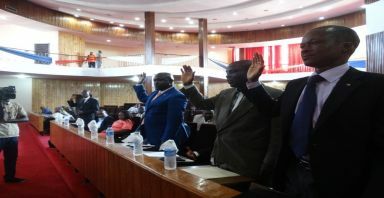 The bill titled, an Act to amend the Liberian codes revised, penal law of 1978, seeks to decriminalize speech offenses in Liberia. 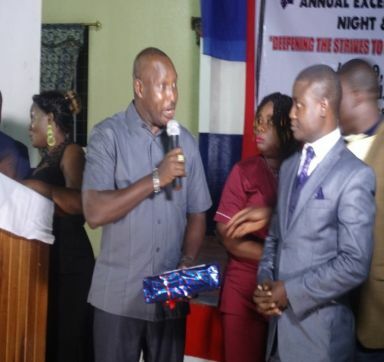 The Press Union of Liberia (PUL) has concluded its Annual Excellence Awards Night, a once a year event. Several journalists walked away with various awards after they were announced winners at this year's Awards Night held in Buchanan, Grand Bassa County on Saturday, 9 June 2018. (Monrovia, May 23, 2018)- The Press Union of Liberia is monitoring a weird criminal coercion court action against Journalist Eric Oldpa Duoe and two others in Yarpah Township, Rivercess County. Early Thursday, sheriffs from a Magisterial Court in Cestos served a writ of arrest on Journalists Oldpa Duoe, Saturday Jududoe and Stanley Wrehdhu for criminal coercion for alleged defamation against an individual identified by the court as Private Prosecutor, Victor Wilson. 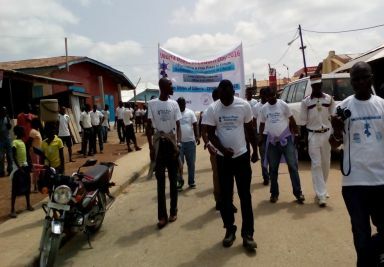 The Press Union of Liberia (PUL) in conjunction with other journalists across the world recently concluded the celebration of events marking world Press Freedom Day. 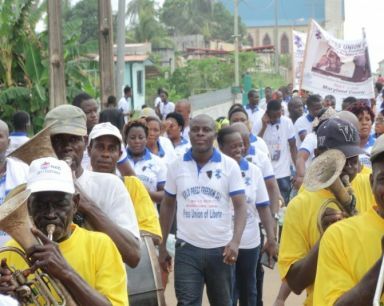 (Monrovia, April 28, 2018)- Maryland County will host the 2018 World Press Freedom Day (WPFD) Liberian celebration as part of ongoing efforts to copiously strength the country's democratic qualities to the World. 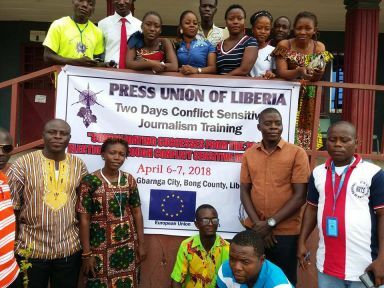 (April 5, 2018, Gbarnga)- The Press Union of Liberia has announced that it will hold aTwo Day Conflict Sensitive Journalism Training on April 6- 7, 2018 in Gbarnga, Bong County. 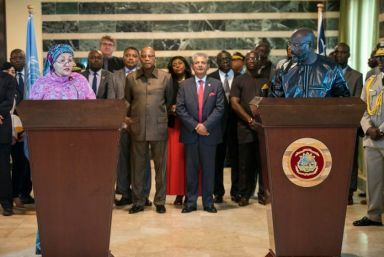 (Monrovia, April 5, 2018)- President George M.
(Monrovia, March 25, 2018) � The Press Union of Liberia is saddened at the speed at which the Executive Mansion is fast leading the reverse of gains made on journalists� safety and Freedom of the Press in Liberia. (Monrovia, March 22, 2018)- For the past few weeks, the Press Union of Liberia has followed with total dismay rabble-rousing comments from different sections of the Weah Administration directed towards the Media in Liberia. (Monrovia, Mach 5, 2018) _ To promote ethical and professional journalism in Africa, media leaders and influences on the continent during the weekend challenged the media to take steps to address issues of hate speech in media ahead of key elections in Central and Western Africa. (Monrovia, February 28, 2018) -To honor the outstanding work of journalists and news entities across Liberia and to showcase emerging talents, the Press Union of Liberia (PUL) is now accepting entries for its 2018 awards.